"How on earth are you able to watch that?" exclaimed Dad as he walked into the lounge. The year was 1989 and the 'that' to which he was referring was a second or third generation VHS pirate copy of Tim Burton's Batman - the first pirate to ever enter my life thanks to a family friend with two VCRs. Now, Batman is a dark film - in cinematography, not story - and with each VHS copy the quality noticeably degenerates, so what I was watching that Saturday afternoon in 1989 was near total black, plus Japanese subtitles. I admit there was a slight ache behind the eyes upon completion, but I was a proud ten year-old to have watched an illegal version of a cinematic release, Batman no less, and this would give me bragging rights at school for at least a week… as soon as the headache also eased! Ever since that day in the late-90s I have watched more than my fair share of pirate material, even more so due to the arrival of DVD and films online. For the sake of this article I am going to define what I consider pirate material because the definition is expansive: it is any film that has not been officially released and packaged by the distribution company. Okay, that is the term in a nutshell and it is open for debate, but that is what I am sticking to over the next few paragraphs. My next pirate experience was in the summer of 1994 following the release of Disney's The Lion King. My uncle and aunt had obtained a VHS copy from somewhere and invited me to watch it one afternoon; an offer that I accepted. Well, Batman may have been dark, but it hadn't been filmed by a camcorder in the back of a cinema like The Lion King. I'm guessing that the operator was suffering from the onslaught of arthritis or the cinema was sat upon an earthquake fault line because the term 'shaky' is insufficient. It was also bizarre to sit in a lounge and see the tops of people's head, catch a silhouette heading to the toilet or listen to people ploughing through their bucket of popcorn. This wouldn't be the only covert cinema filming to pass my way over the years - the latest being Superbad - but they are the worst pirates available and there is no fun to be had from watching them. Yes, fun because you don't watch a pirate copy expecting anything else, or if you do then you are in for a disappointment. Pirates are just crazy experiences and shouldn't be treated as anything else. I am a movie fan and all of the pirates that I have watched were also enjoyed again on the official release, but there is something special about that naff version you get from a mate's mate. One of my favourite parts about watching some of the pirates that come from Asia is the English subtitling. I know many of you wouldn't think to activate the subtitles, but with my wife not being a native English speaker she likes to have the subtitles just as something to fall back on for the complicated words. However, it is often the basic words that trip up the subtitles in Asia and it is the complicated ones that provide the humour. For example, in the version of Spider-Man we watched there is a line (I think) "We need to get the plasma enhancers online", but Mr. Slightly-Deaf Subtitler wrote "We need to get the placentas online." We had to rewind to make sure we had both read it correctly… we had. There are other more 'official' pirate versions, such as the ones copied from copies handed out by movie studios as 'Viewing Copies' that occasionally have the name of the studio and a copyright warning scroll across the bottom, or some that have a clock counter playing throughout the entire movie, but those versions aren't much fun. 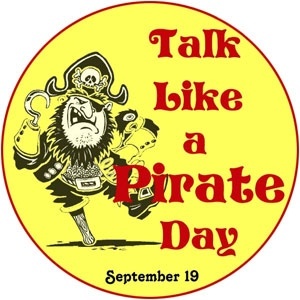 I personally hate the idiotic piracy trailer that plays at the start of most DVDs, you know, the "You wouldn't steal a handbag…" one and the flyers stuck inside DVD cases, "The last pirate DVD I watched turned out to be a horror…it should have been a comedy" - Urghh! I'm sorry but if people don't know what to expect when they buy a pirate DVD by now then they deserve to have an unpleasant experience. My advice is never buy them, borrow them and have a great night laughing at the horror of it all… and then go and buy the official release. "Piracy is theft": As piracy, copyright infringement and theft of property are legally distinct in all jurisdictions, the statement that "piracy is theft" is never literally true. Theft is a fascinating concept. Did the European invaders of the Americas steal the country from the inhabitants? To many of the owners the possession of land was an odd idea.Are the Israelis stealing Palestinian land with their settlements? If two people watch a rented film is one of them stealing? If a Mexican or a Canadian breathes in air from the USA is he stealing? Ownership provides many benefits to society but raises many odd questions. There is piracy and then there is piracy. Does copyright pirating include influence and inspiration? When Kimba the Lion King came out there was a controversy regarding its resemblance to the Japanese television show “Kimba the White Lion.” Most characters in Kimba have an analogue in “The Lion King” and various individual scenes are nearly identical in composition and camera angle. Disney’s official stance is that the similarities are all coincidental. What about the acknowledgment of inspiration? Most critics of the film mention the following as inspiration sources: the Bible stories of Moses and Joseph, Shakespeare’s play Hamlet, Greek tragedy in general. The symbol of the Lion also echoes to my mind C.S. Lewis’ Anslan. Should all those inspiration have been acknowledged or is Disney entitled to reinvent the wheel by pure coincidence while laughing all the way to the bank? Sorry but I never got that kind of joy from pirate copies..
One thing I do think about though when watching movies - what movies 'have to' be seen on the big screen? I have a few in mind, mostly action films, but ultimately I think most well shot films should be screened in the cinema. Most of them can't though, so..
Asa - for you: what's the difference in film experience whether it is a cinema or pirate copy experience??? No. Piracy does not include influence and inspiration.